I was just wondering what I could make for dessert for Christmas Eve dinner that would fit my Moroccan theme, when Alia posted a new recipe on her website for Almond Ghriba. After watching her video, it looked so easy and quick, that I made the decision to bake some for the dinner (and try out a couple beforehand). I found that Bob’s Red Mill sells an almond meal, which is really the same thing as almond powder. Great…I wouldn’t have to grind up my own! While dinner was cooking tonight, I made up the dough….it only took about 5 minutes, then wrapped it in plastic wrap and put it in the refrigerator for an hour. 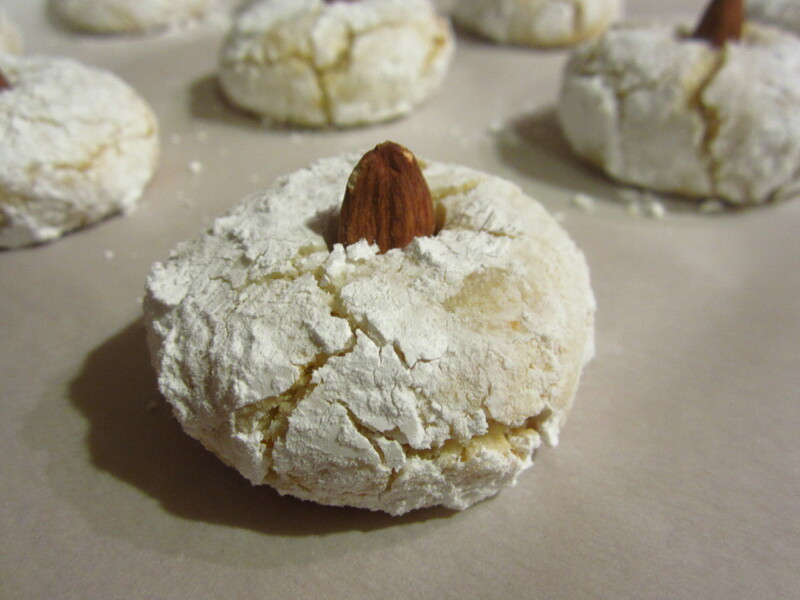 Once chilled, I followed Alia’s instructions for size and shape, then finished them with a dusting of powdered sugar and a single almond in the center before putting them in the over to bake.